In “My Morning Cup” there is a paragraph about a particularly persistent purple pansy. In the chapter entitled “When I Sit in the Backyard” I write: One of my favorite backyard stories teaches me perseverance. One cold February day after the snow had partially melted, I saw something purple on the ground. Upon closer scrutiny, I discovered it was a pansy peeking through the snow. I had planted it the previous summer, and it should not have survived the harsh winter. It was not meant to be that hardy. However, it did survive and it thrived. I took a photo to remind me of the lessons I wanted to remember from that fragile but tough pansy (that sounds like an oxymoron). With God, we have the opportunity to keep blooming when the circumstances are tough. Paul describes this kind of faith in 2 Corinthians 4:9 when he says “we may be knocked down but never knocked out” (Phillips Translation). A few days ago I was greatly encouraged by a new sighting! My time and attention has been “extra occupied” over the last month and I’ve had little time for extended prayer, study, writing or thinking. You know those times when the day goes by and you have gone from one thing to the next and you feel a little more spent than usual? Or you may have done a lot and gone through a lot but not yet had time to process those things in your mind and heart. Or you may feel you just need to catch up on some rest. On the other hand, my daughter would love to be up and busy, as she is completing a month of bed rest- most of which took place in the hospital. All of these things take perseverance. As with most things that require waiting, repetition and “keeping on keeping on” we don’t always see an immediate end, reward, or response. 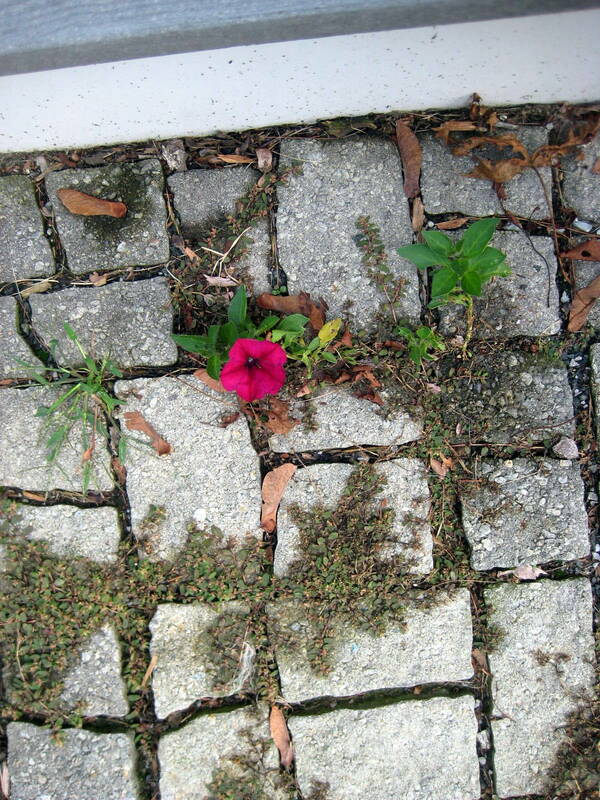 As I walked out my front door and saw this new lone purple pansy (or petunia) this scripture came to mind. Do not be deceived: God cannot be mocked. A man reaps what he sows. The one who sows to please his sinful nature, from that nature will reap destruction; the one who sows to please the Spirit, from the Spirit will reap eternal life. Let us not become weary in doing good, for at the proper time we will reap a harvest if we do not give up. Therefore, as we have opportunity, let us do good to all people, especially to those who belong to the family of believers. That same pansy (or it seems I’ve confused pansies for petunias) that had reappeared once before was alive and well yet again! It was not in the exact same place and didn’t look exactly the same but it was back again! I had walked down my front stairs to my landing and saw this purple pansy that had come from the one planted several years before. I had not transplanted it. The pansy (petunia) plant had gone long ago. Currently it is not even the season for pansies (or petunias 🙂 ) to be blooming. Yet this lone pansy (petunia) just appeared on my landing, which is about 15 feet away from where the original one once grew! Like this pansy (petunia), good things we may be “routinely” doing may not “reap a harvest” until later. So, whatever you may be weary doing take heart and keep on going! You never know when and where the resulting “harvest” will appear. This is a wonderful experience .and story well tolded. My The Lord keep blessing you.